Happy Birthday to You was our free with qualifying orders for our June 2017 Release and we are also introducing its companion cutaways. We have a new addition of the In Bloom series. 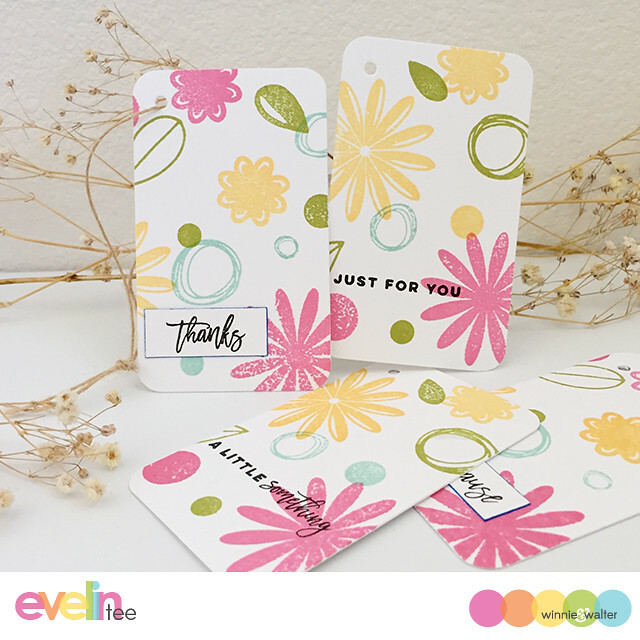 In Bloom: Shirley's Blooms has a funky, imperfect flair that will add a bold impact and will work well with other stamp sets especially In Bloom: Eva's Favorite Flowers. We are also releasing the companion cutaways for In Bloom: Shirley's Blooms. 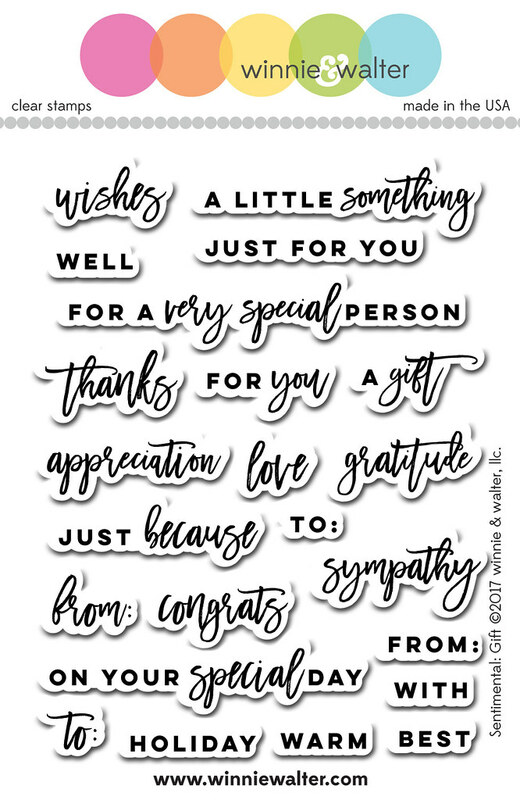 We have a wonderful new addition to the Sentimental collection called Sentimental: Gift with sentiments perfect for all sorts of occasions where you may be giving a gift and more. Sentimental: Gift will be our special free with purchase stamp set as a thank you gift. See below for more details. Thank you so much for all of your kind comments and we are so happy you are enjoying what our August Leading Lady, Ashwini Rao, and the Talent have shown you so far. I am back with another couple of cards today. I went with bold and bright colors today using fuchsia, pink, persimmon and pale orange and at times lime green (I really do love the cheerful vibrancy of lime green). First, I began with a little card that would be great to add with a gift or to make several of to have on hand as they really are good for all ages and genders by simply changing up the colors as you wish. I began by inking up the cake from Happy Birthday to You with persimmon, pink and fuchsia inks. I then cut out the cake using the Happy Birthday to You Cutaways. I also inked up the candles 3 times with pink ink on white cardstock and cut then out along with the largest flame from yellow-orange cardstock and I stamped the smaller flame in persimmon. I adhered the flames to the candles and the candles to the cake. I also cut out the scallop frosting details from Happy Birthday to You Cutaways in white cardstock and added those to the cake. I cut out the smaller postage stamp rectangle from Essentials: Lana Cutaways in white cardstock and adhered the cake with dimensional foam adhesive onto the card and postage stamp layer. 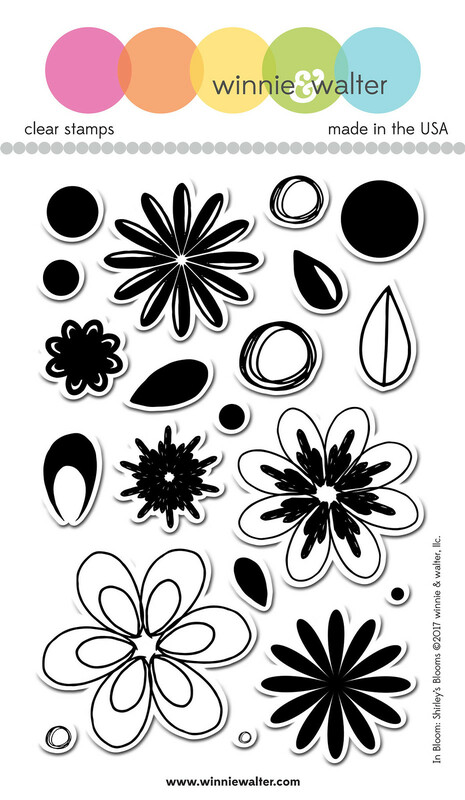 For my second card I stamped the large outline flower and bisected leaf from In Bloom: Shirley's Blooms using black ink on a piece of cardstock creating a background. I then stamped in the two parts of the petals and leaf with the solid stamps in the set. 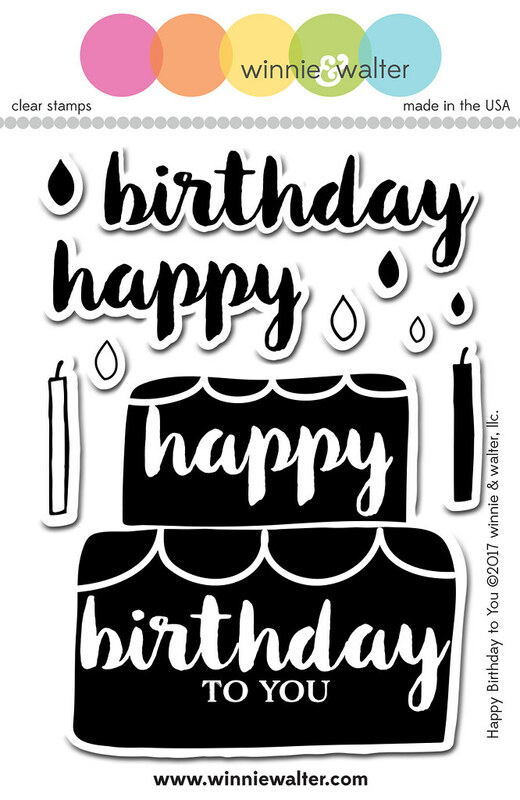 I stamped "happy" and "birthday" in black ink using Happy Birthday to You and cut them out using Happy Birthday to You Cutaways. Over a strip of black cardstock I adhered the sentiment using dimensional foam adhesive. Then I adhered the panel to a white A2 card base. How is that for a groovy card? My cards are a very simple introduction to what can be done...wait until you see the marvels guest and The Talent have in store for you! Please be sure to click the links to their blogs and leave them some love. 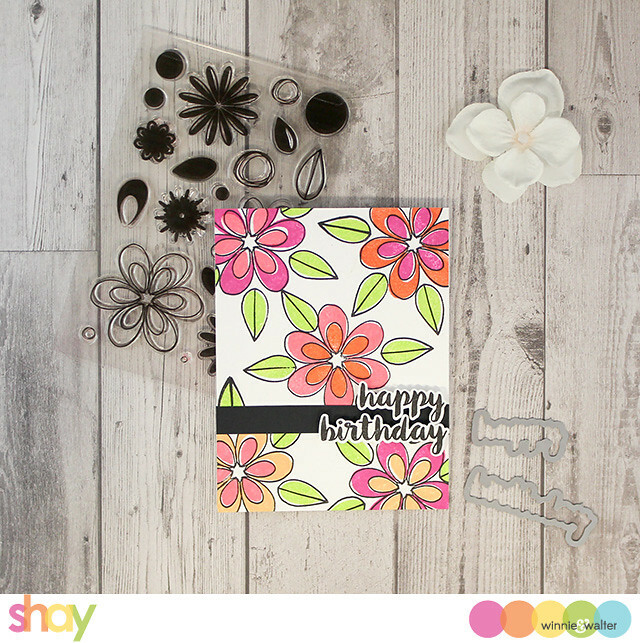 Comment here on this post for a chance to win Happy Birthday to You stamp set + In Bloom: Shirley's Blooms stamp set + Sentimental: Gift stamp set + Happy Birthday to You Cutaways + In Bloom: Shirley's Blooms Cutaways of your own by 11:59 p.m. (central standard time) September 1, 2017. One comment will be chosen at random. This release day is so colorful and cute! I already have the happy birthday cake stamp from the last release but I still love it! The new shirley blooms stamp set is so awesome, I love all the different varieties that it offers with all the different flowers. 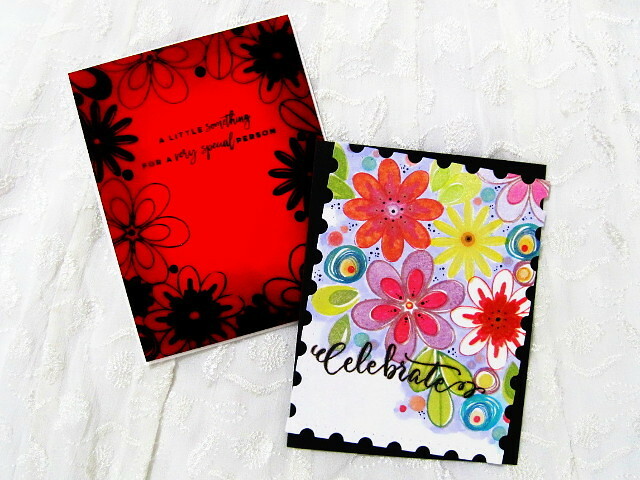 I love both Heather P. and Heather H. cards, they both showed off the new products perfectly. Great day number 2!! Awesome! Such beautiful showcasing in Happy colors! Love the new bloom set with so many inspirations! Love these simple & pretty blooms. Fabulous inspiration by the DT. Lovely release. The flowers are so fabulous, as well as the sentiment set! Vibrant, delightful celebration happening allll over this post! Crushing over the blooms; smitten with the scrumptious cakes! Thrilled that you've added a die set for the cake! A dazzling release...and it's only Day 2! Love the examples from your team. 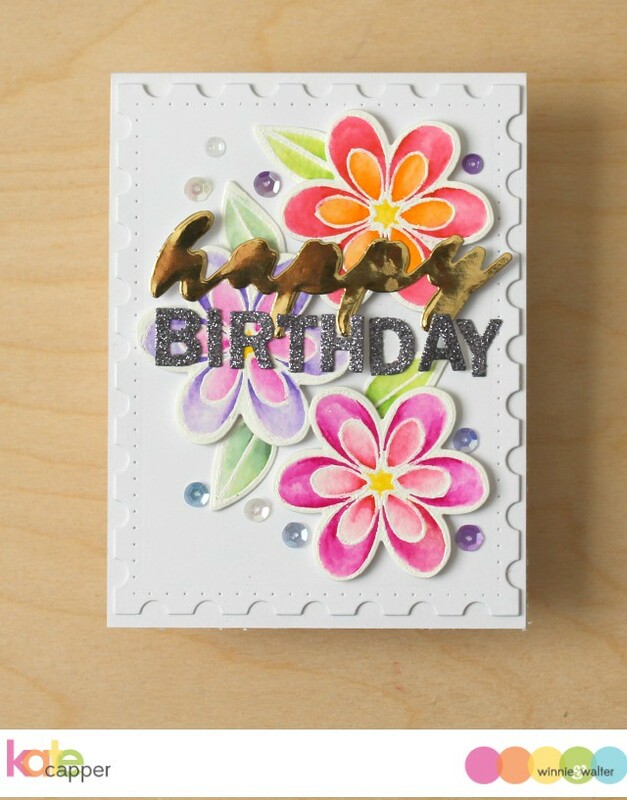 Can never have too many happy birthday stamps and dies. Beautiful cards :) love the new shirley blooms stamp set, very pretty. Wow, so much beauty on one page. These are wonderful sets, I can hardly wait to get my hands on them. Beautiful cards and tags! I really love that fun birthday cake! 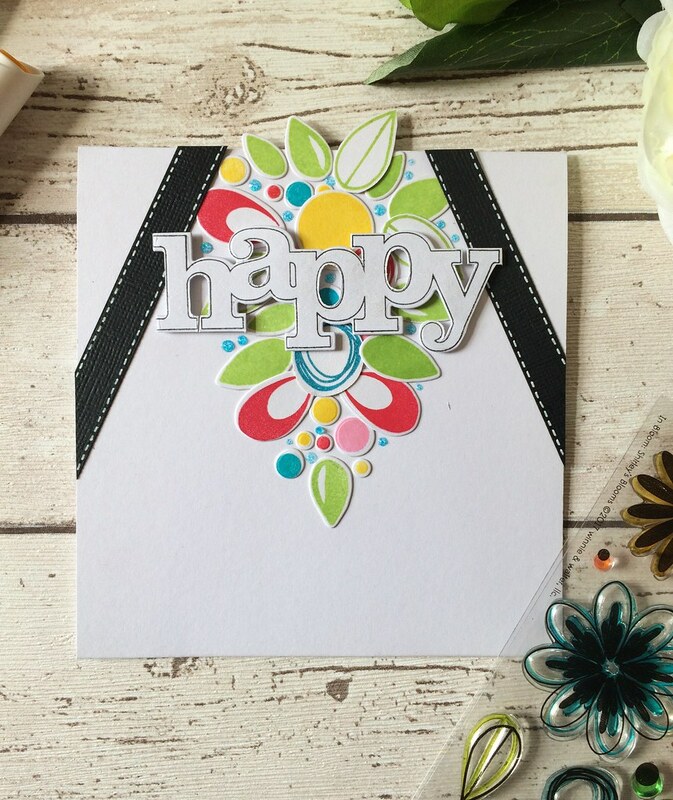 Shirley's Blooms is lovely, and the mixed font styles and sizes in the Sentimental: Gift stamp set looks fabulous! So many possibilities! Boy oh boy--absolutely love all today's products & the samples! Thought I had enough flowers, but nope--NEED these, too! Love the sentiments--always looking for new ones! Thanks for a chance to win! I missed out on the Happy Birthday To You stamp set when it was a free with purchase item, because I'd made a pact with my bank account that I wouldn't buy any stamps that month. 🤣 I'm not passing it up this time!!!!! I'm loving everything that's been shown so far! Love the flowers, and the birthday cake is super! Such happy and vibrant cards today! I do love the new In bloom addition. Love that you can choose to either colour them in by hand or use the other stamps to do the colouring for you. Sentimental: Gift is a must-have, but then, almost all W&W stamps are must-haves lol. Me too in favor of Sentimental gift set..I just loved the mix of fonts.Its very interesting to see how the team.creates different varieties of cards using similar stamps ! Yummy cake and very pretty flowers. Great new products! Love the flowers set especially. The DT did a great job showcasing the new sets! Thank you for the chance to win!! Wow! Gorgeous cards!!! Love the Happy Birthday to You stamp set!!! I love all these festive birthday products...so much fun! 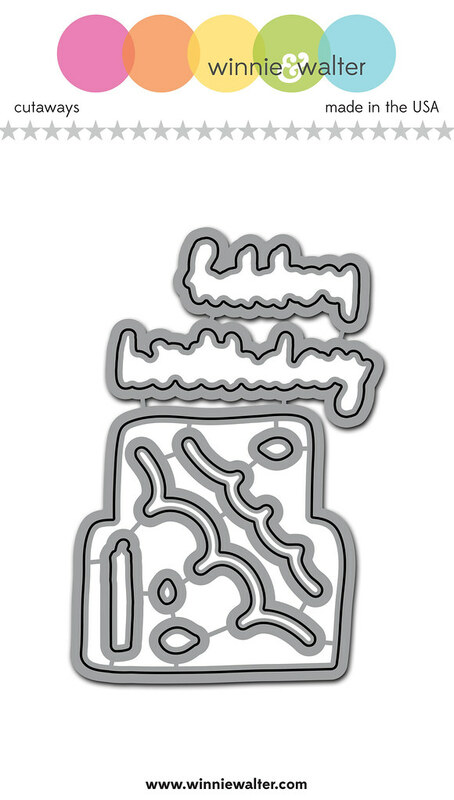 I love the Happy Birthday to you cutaways as I did receive the stamp last release!! 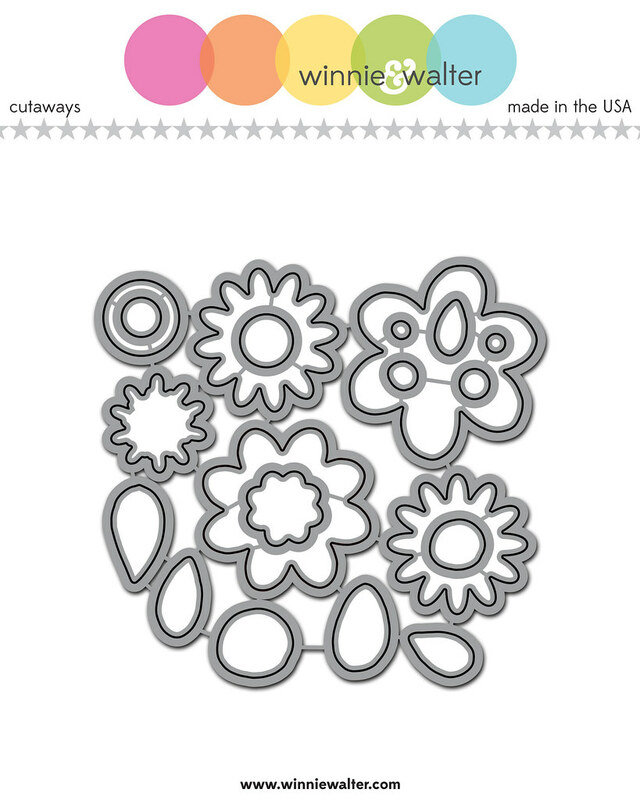 Shirley's blooms stamp set and cutaways are gorgeous!!! Wonderful release!! Fabulous stamps!! Really like that big cake stamp!! Oh my goodness - and gorgeousness, Shay... your cards are so delightful! Beautiful and bright cards. Loving that there is another Sentimental set. How gorgeous are these flowers!!??! And I love the mix of sans serif and cursive fonts in Sentimental: gifts. Great card ideas from the team! Such a happy and bright release, love the wonderful sentiments! Such gorgeous projects by everyone. And some really cool designs. Wow! Loving these blooms, especially how some can be stamped and some colored. How nice to have both in one set. The sentiment freebie is Fantastic! I'm pretty sure it will be easy to hit that $24 mark, LOL! PS Awsome cards from the DT!! What awesome cards by everyone!! I can't begin to comment on each one of them because I would go on for paragraphs doing so! (My comments always end up being TLDR anyway! Ha.) 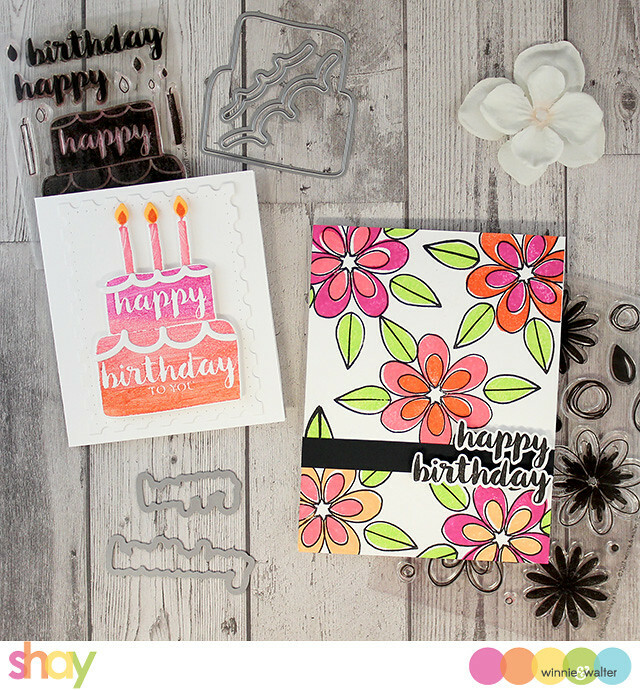 Love the funky, groovy look of the new floral set and the fun and pretty birthday cake set. The Present sentiment set will be VERY useful!! Fabulous inspiration from everyone. Love the beautiful ideas using the new stamps and dies. Oh my gosh !! I love all the sets on this page : the birthday cake is too yummy, the blooms are adorable ! I want them all !! Love the great variety of sentiments...absolutely love the birthday cake. So fun! I really love today's products and the projects make them look even more fabulous! 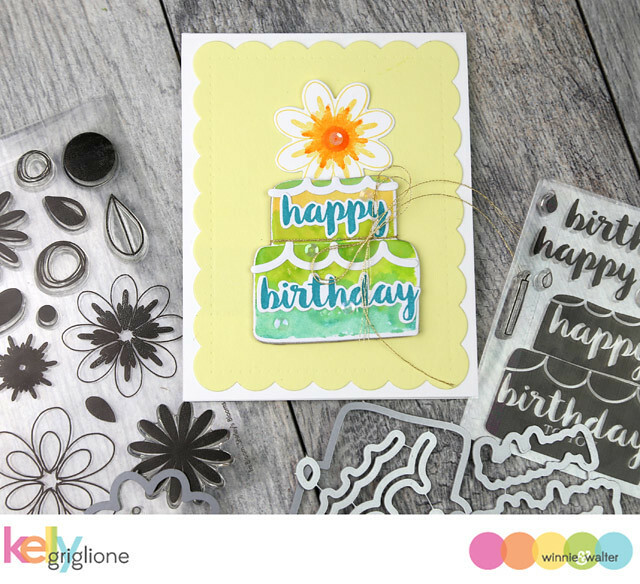 Love the new Happy Birthday to You stamp set! The cake is such a great size! The new Happy Birthday to You Set is so fun! I love the size of the cake. 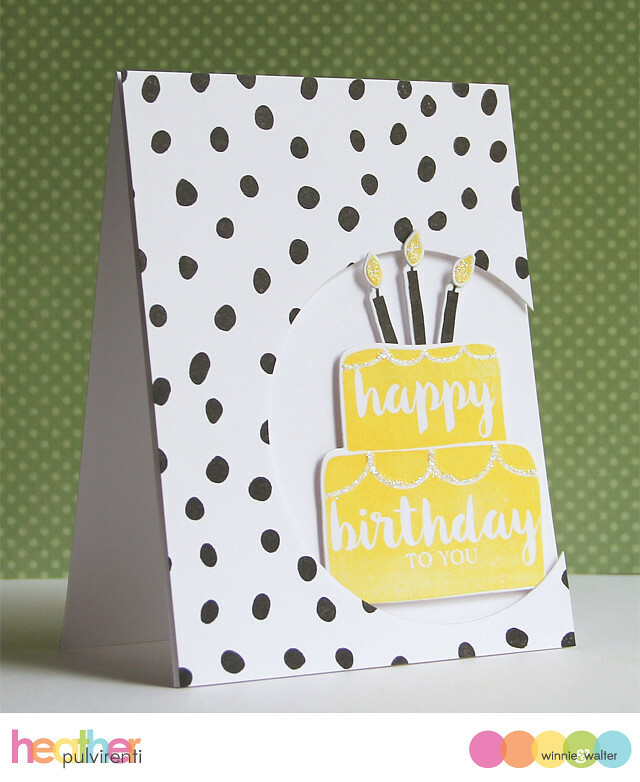 It makes an awesome focal point for the front of any birthday card and it could be used for people of all ages! I love birthdays and I love cake...so of course I want this one! The flower are also beautiful to the max! Love both the sets today. Very beautiful inspiration too. I love the nice big size of those flower stamps! Love all those flowers and the bright happy colors. 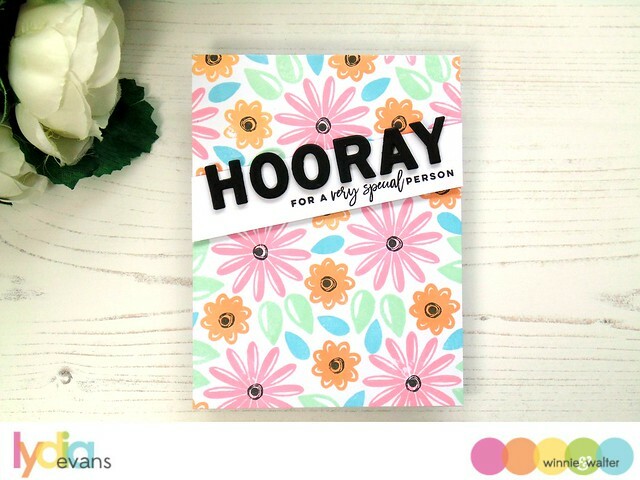 Wonderful and inspiring cards and fabulous release! Loving the new sentiment set! Such great new products!!! Love all of these!! Also love all the fabulous inspiration cards!! 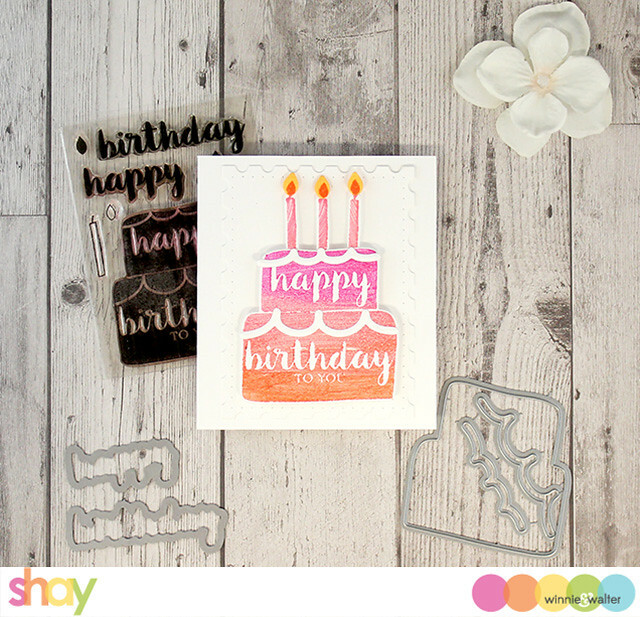 Love the Happy Birthday To You stamps and cutaways!! So super duper fun! And I absolutely NEED that new Sentimental: Gift stamp set! So perfect for so many occasions!!! Awesome sample projects too!!! Beautiful cards! Love the flowers and the Sentimental Gift stamp! Love the stamps and dies here. The Sentimental: Gift is a must have stamp set. Oh my....love love love these floral/cake/sentiment stamps and each take on it is stellar! Beautiful flower and sentiment stamps! Love it!! 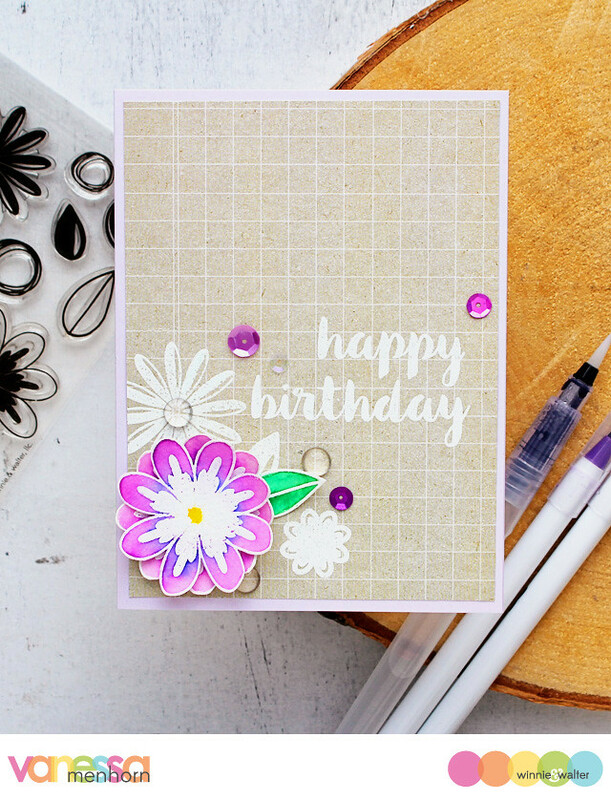 I love the flower stamp set and glad to see a die set for the Happy Birthday stamp set. Design team knocked this day out of the park. Can't wait to see the rest of the release. Ooooh! Loving the new flowers!!!!! I love the sentimental set! 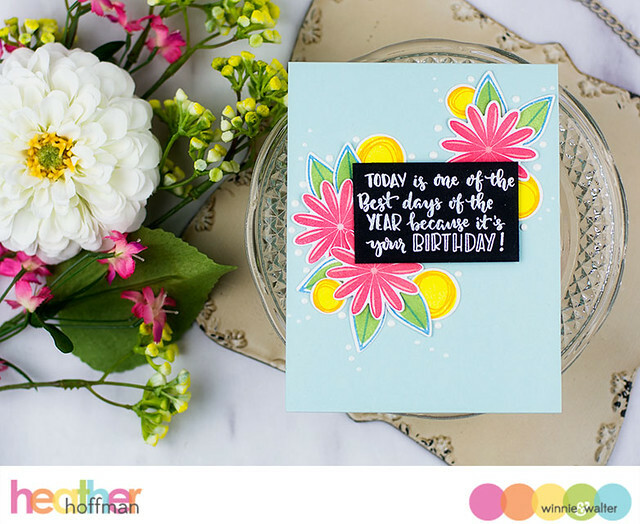 I don't think any card can go wrong with blooms or a birthday set. The stamp designs are so clean and beautiful. More gorgeous, fun flowers - love them!! GROOVY cake, blooms and sentiments! The cards from your design team show some gorgeous and creative ways to use these nifty new stamps! Cute stamps for this release! All of these new releases are so cute! Lots of creative ways to use them. This new release is a super happy one, the lovely creation definitely put a smile on my face! Beautiful stamp set...love the inspiration from design team.. a great release..
love that happy birthday cake! Such great inspiration and beautiful stamps! WOW flowers and cakes and gorgeous sentiments! !